Chiropractic care is for anyone that wants to achieve their optimum potential in all aspects of life. Our mission is to give, love, and serve out of our own abundance and provide you with the best chiropractic care experience in order for you to reach your highest potential. Whether you have been in a car accident, are experiencing neck pain, back pain, headaches, any other health concern, or you just want to start expressing 100% life, we can help you. We applaud you in your efforts to seek safe, natural, and non invasive care for optimum function and health. We will do everything in our powers to help you reach your healthcare goals. We look forward to serving you. 31 percent of NFL teams use chiropractors in an official capacity as part of their staffs and a full 77 percent of the trainers have referred a player to a chiropractor for evaluation or treatment. A survey of certified NFL trainers revealed that 100 percent of them agree that players will use Chiropractic care without referral from the team medical staff. 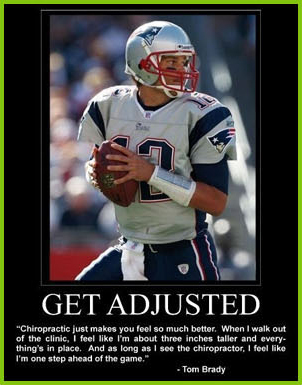 "Chiropractic just makes you feel so much better. When I walk out of the clinic, I feel like I'm about 3 inches taller and everything's in place. 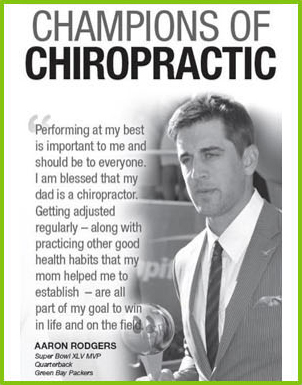 And as long as I see the chiropractor, I feel like I'm one step ahead of the game." When asked how he stays in such great shape, Emmitt Smith often responds, "a good chiropractor." Many people don't know that Tiger Woods rode upon a Chiropractic Float in the 1995 Pasadena Tournament of Roses Parade. 7 Time Winner of the Tour De France. Lance's chiropractor has traveled with him on every Tour De France. "Those are the guys that put me on the field when I didn't think I had a chance to be on the field. These are professionals, and God put them in my life for a reason." Arnold has been a huge supporter of chiropractic for many years. One of his old muscle beach buddies, Dr. Franco Columbo, is a chiropractor in Southern California. Utah Jazz player says about chiropractic, "it's been great for me, and for my family." Did you know that recent studies indicate that almost 80% of women experience lower back and/or pelvic problems (and pain) during pregnancy? In addition, the inability to do much about it has led many women to feel that they could not enjoy their pregnancy due to such discomfort. For this very reason, we felt a strong need to offer these women the services they need to have an optimal pregnancy experience. The body’s intelligence wants the easiest route out for the baby. If mother’s biomechanics are compromised, obstetric interventions are more likely to be recommended and implemented. Each and every intervention has significant side effects for both mother and baby. At Life First chiropractic we make sure the mothers body is functioning at 100% so interventions are not needed. A woman's body is AMAZING and is made to go through the wonderful process of birth naturally. The mother’s pelvis has various key ligaments attached that support her uterus. As the baby grows, their role becomes increasingly important. If her pelvis is in biomechanical balance during pregnancy, the uterus will be supported symmetrically. This allows the baby optimal room for movement in utero and provides it the opportunity to develop free of constraint. Why Would My Kids Need Chiropractic Care? A child encounters many physical stresses during their growing years. The resulting problems in children’s spines can occur at almost any point in their development and growth. One of the most common reasons for parents to seek care for their child is physical trauma from an injury of some sort. The spinal misalignments that may occur at the time of the injury will not necessarily result in immediate pain or symptoms. In addition to physical stress, parents should be aware that emotional and chemical stress affect the child’s nervous system and may also warrant a spinal checkup. When children get these issues corrected at a young age, they are not going to grow up with the same problems that their parents might have. What does chiropractic care for children involve? When I tell people that I care for many children and babies in my practice, their initial reaction is often one of surprise, as they assume that I use the same techniques on children as I do on adults. Chiropractic care is ‘tailored’ to the individual and their particular spine, and children are no exception. We offer specific, gentle adjustments appropriate to the infant and child’s spine. In general, care for children is painless, except in cases where the child has an actual injury. In these areas, the child may be sensitive to touch; however, once the adjustment has been made and the area can heal more effectively, the sensitivity is alleviated. Overall, most parents report that their children enjoy their spinal adjustments, and that they look forward to their next visit. The risks of a child suffering notable injury from a spinal adjustment are extremely minimal. Chiropractors have been adjusting children’s spines for more than 100 years and have an excellent safety record. How can I tell if my child has a spinal problem?